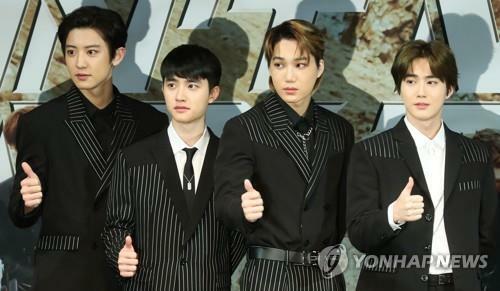 SEOUL, Nov. 1 (Yonhap) — EXO, “the kings of K-pop,” returned with a new album on Thursday, bringing together all nine members for the first time in more than a year to stage a new collection of music filled with masculine vibes. 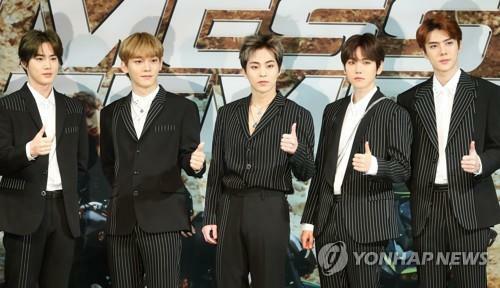 The group’s fifth full-length album, “Don’t Mess Up My Tempo,” set to be released on Friday on major online music stores, is its first group performance since “The War,” released in July last year. During the interval, each member was active in different fields of entertainment, with team leader Suho starring in two high-profile local musicals. Member D.O., whose real name is Do Kyung-soo, starred in the popular tvN TV drama series, “100 Days My Prince,” which wrapped up earlier this week. The latest album is rich with masculinity with a special theme of supernatural powers. EXO adopted the concept of bikers to maximize their masculine vibes. The album’s main track, “Tempo,” is an energetic hip-hop dance song with booming bass sounds. The record carries two versions of “Tempo,” one each in the Korean and Chinese languages. EXO members said they hope the song can drive up the daily tempo of its listeners. The song’s choreography is the most breathtaking of all the dances EXO has performed so far, Suho said one day before a special showcase of the new album. The showcase set to open in Incheon, just west of Seoul, at 8 p.m. will be broadcast live through V Live, an online broadcasting platform operated by the top Internet portal Naver. Members said the maturity they have earned through their seven-year career at the forefront of K-pop was naturally carried into the latest album. Gravity is one of the supernatural powers featured in each track. The second track “Sign” is built around the psychic power of controlling fire while the third track, “Ooh La La La,” features the power of teleportation. With the new album, EXO has already renewed its own history, selling more than 1.1 million copies in preorder after its four previous full-length albums each sold 1 million copies in advance of their releases. After seven years at the forefront of the K-pop scene, the members are very eager to join hands with other K-pop artists to help further spread K-pop across the world, the members said.